The Supreme Court has just finished hearing arguments on whether it should take up the constitutionality of California’s Prop 8 and the federal Defense of Marriage Act, and of course i’ve been following these arguments with some interest since it has become increasingly clear that a tipping point has been reached and a clear majority of Americans now feel that gays ought to enjoy the same federal benefits as heterosexuals. What i find most intriguing, though, is the realization of how much has changed in the last few decades. The Bay Area has long been a sanctuary for gays, but even here times have changed. Shortly after i moved to San Francisco in 1975 i met a man named Ed Petersen and began running around with him. Although he lived here in the city, he worked in the Planning Department of the City of San Mateo and learned that the proprietor of a moribund local roller-skating rink had, in a desperate attempt to drum up business, declared Tuesday night to be Gay Night. Its popularity had almost immediately exceeded his wildest expectations, and suddenly, Tuesday became his best night. The place was thronged with gay men skating their butts off. Ed took me down there a couple of times, and we had great fun skating with our fellow gays. Well, the entire first time and partway through the second, when Ed grabbed my arm in a panic and dragged me off into the shadows at the side of the rink. He’d spotted at the front desk a reporter from the local newspaper, a man with whom he’d had a couple of unpleasant encounters in his official capacity at work. So he knew the guy would take great pleasure in outing him and that even though this was 1975, it wasn’t in San Francisco, and he was certain his employer would find some reason to get rid of him if there were evidence he was gay. So we stayed in the shadows and watched while the reporter moved up to the raised gallery from which he could get a good look at all the skaters as they rolled past. We crept to the back door only to see that it was, alas, an alarmed emergency exit. But then we noticed that the reporter had taken a seat in the gallery and that by duckwalking along the front edge of the gallery, we’d be below his line of sight. So that’s what we did, allowing Ed to escape out the front door unseen. I hung back and turned in our skates before i joined him in the parking lot, where he was hiding behind my car. And that’s the way it was as late as the seventies. 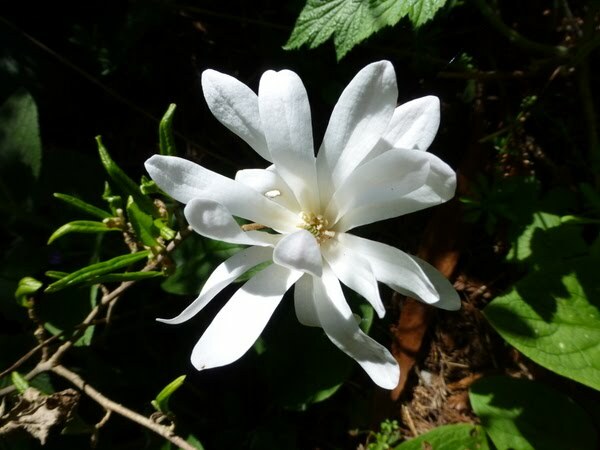 But here’s a magnolia at the AIDS Memorial Grove in Golden Gate Park. While i’m getting Allen’s name chiseled into the memorial circle, i’ll go ahead and add Ed’s. Now that i’ve outed him.